The SkyGlider can be compared to the wings of the Greek God Hermes, who was able to glide in the sky above the Olympic mountain. Flying with the SkyGlider allows you to reduce the vertical speed and to provide sufficient horizontal velocity to accurately reach a target at some distance away from the exit point. 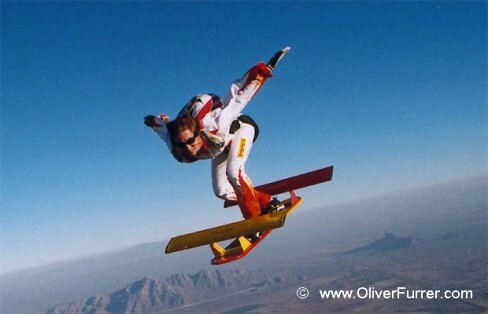 In October '98 Oliver Furrer made the first test jumps with the SkyGlider at Skydive, Arizona. 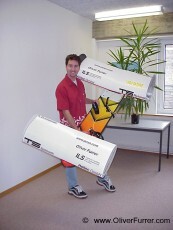 It was not easy to get this board into a plane, since it is extremely cumbersome. Many people were sceptical that this ‘thing’ would even fly at all. But Oliver proved them wrong. With some practice he was able to fly a straight distance course for some time. He also found out that he could do some steep tracking turns. The sink rate of the SkyGlider is so slow that Oliver was able to stay in the air for up to two minutes. In order to do this, he had to use a larger than normal parachute to give him the ability to make faster openings. The purpose of the test jumps in Arizona was to adjust the aerodynamics of the board. After a few jumps, Oliver was able to determine what adjustments were needed to be made to enable this board to fly over the Alps both efficiently and safely. One of the most important changes was to set the angle of attack of the front and rear wings correctly. This change enabled him to stay in the windshield of the board, and also allowed the wings to drive him forward. Once he was confident that the board was ready for the world record, the count down to Switzerland began.